Spin and glide Bloom down centre stage to the music beat. Concert Bloom comes with her cool guitar, headset, microphone and travel tote. Requires 3 x AA batteries. 1 Doll supplied…. 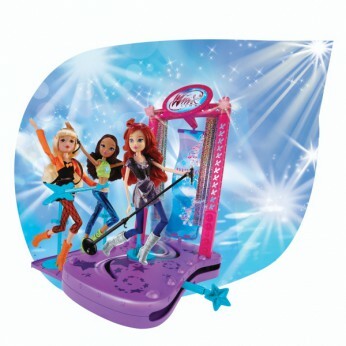 This toy costs approximately £19.99 (for the latest and best prices make sure you check our retailer list for the Winx Club Concert Stage Playset with Doll above). In our review of Winx Club Concert Stage Playset with Doll we classed it as being suitable for ages 3 years, 4 years, 5 years but recommend you check the manufacturer specific advice before purchasing.